Cyclepalooza | Skids, laid and dressed. Meet at Eau Claire Square (in front of the Y) around 7pm. Ride leaves at 7:30pm sharp for a short 20-30 min. easy paced ride to the secret skid contest location. Contest will commence immediately and prizes will be awarded once everyone is skidded out. If conditions are good there will probably be a bbq afterwards. This event is a go no matter the weather. If it is raining we’ll move underground. 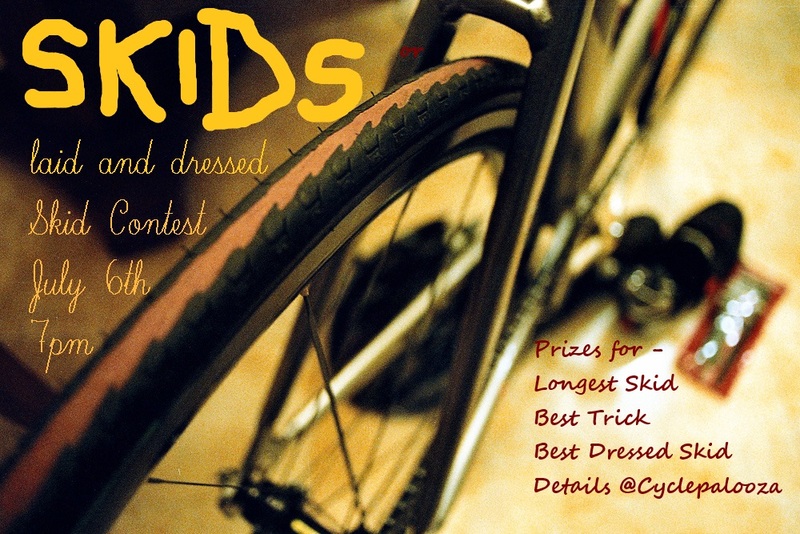 Also, people can show up dressed as a skid and win that contest without competing in the skid contest. The more spectators the better!! Finally, we are aiming to bring enough spare tires that if you pop your tire we’ll give you a new one – no charge! – pending availability of course. Lets end this years Cyclepalooza with a bang – literally!